Well folks we’re only 10 days out from what promises to be one of the finest Hootenannies yet September 19-20! 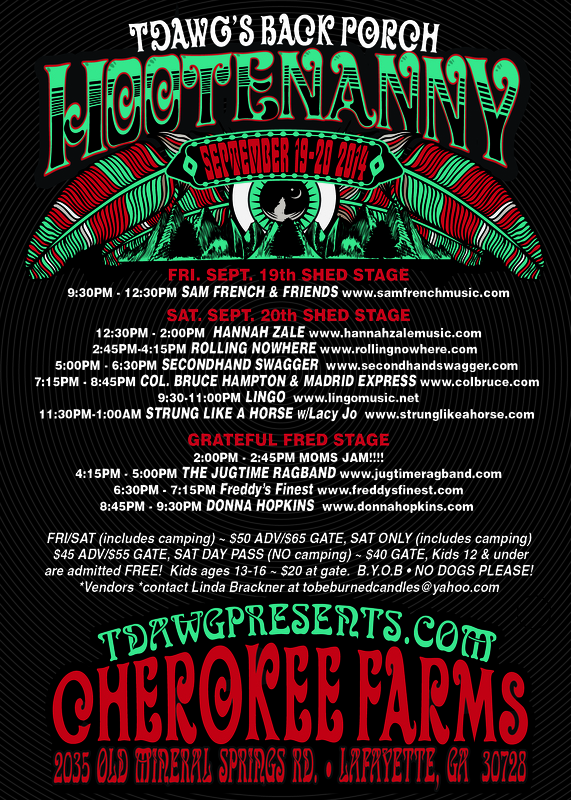 You can get your advance tickets by visiting the official TDawg’s Back Porch Hootenanny page and clicking on either FRI-SAT or SAT only – both include camping! Atlanta’s Rolling Nowhere just successfully completed their first tour out West, and let’s just say it rejuvenated and inspired the fellas, and they’re gonna bring it to you on Saturday afternoon September 20! Below is a live video from a performance in Nashville a few months back, showcasing their rockin’ and raucous sound – comin’ right atcha! Chattanooga’s own Strung Like A Horse has been tearing it up for several years now, and TDawg Presents is excited to have them as a staple of TDawg’s Back Porch Hootenanny! Their unique brand of music, which they affectionately describe as Gypsy-Punk-Garage-Grass, will have you boogeyin’ late into the night! Check’em out below in a clip from Music City Roots. Y’all this is going to be a BIG time! Don’t miss out on it – get your tickets now!